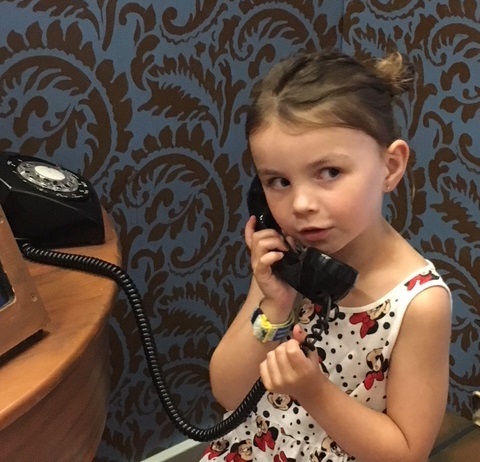 The 2018 Apraxia Kids National Conference in Charlotte, NC was, in a word, fantastic! Being a family of five, committing to a journey like this was only possible if we could find the funds to make the trip. We had decided at last year’s Guelph Walk for Apraxia that we would make every effort to attend in 2018. So, we planned to make it our annual family vacation destination and stay for a week and be tourists. Because this year’s conference was held in Charlotte, NC, it allowed us to drive as opposed to fly, which saved us a great deal of money. We found a great house to stay in during our visit which Brooklyn called “the fun house” on AIR BNB which was far more reasonable on the budget than the hotel rates! It also allowed everyone to have some space, which is always a good thing. 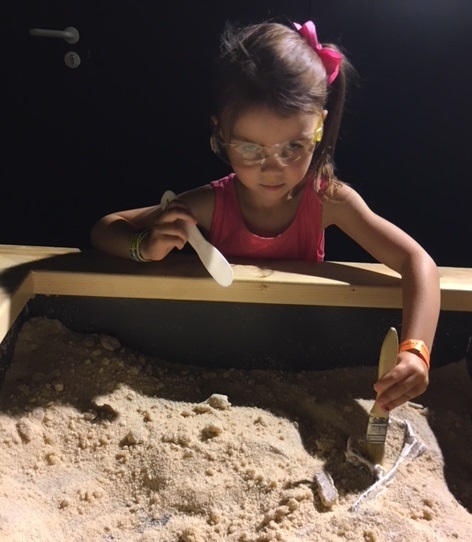 While we were making our plans to attend, we discovered that Apraxia Kids offered a Scholarship Program which offered three different levels of scholarships to potential recipients, the top scholarship amount of which was $500 USD. To apply we simply had to complete a questionnaire and submit it by a specific date. We believed it would be SO great if we could be granted any amount of assistance in the form of a scholarship, no matter the dollar value. Since Brooklyn’s diagnosis, Brittany and I have put a considerable amount of time into advocating for Brooklyn and raising awareness in our hometown of Welland, Ontario. I feel this is especially important to mention, because the questions on the application focused on the type of work and effort being put forth in one’s community. So, we submitted our application and patiently waited for the response. The day finally came when there was an email from Apraxia Kids regarding the status of our application. I opened it up fully expecting to be declined (especially after having the good fortune of being chosen to receive a speech tablet). To my great surprise, we were chosen, as the only family in Canada to receive the $500 USD Scholarship!!! I couldn’t believe it!!! We did it! Brittany and I could not believe it and were very excited. We couldn’t wait to share our news with everyone we knew. The National Conference itself was nothing short of spectacular. The venue was top class and the environment was exhilarating! To be honest, it was a little overwhelming because we didn’t know quite what to expect, however, once we were there and we were registered, everything just seemed to come together. There was so much information available at our fingertips; literature, experts in the field of childhood apraxia of speech, parents and family members of those with apraxia of speech. It was just so surreal to see and be a part of such an amazing community and gathering of like-minded and similarly passionate people. I must say that it was difficult to choose which “courses” we wanted to attend. We could only attend one at a time and there were so many to choose from and there were so many experience levels! Brittany and I were amazed! We both felt the courses we chose provided us with new knowledge and ideas about all aspects of childhood apraxia of speech from discovering your child has apraxia of speech, to different therapy approaches to schooling ideas for teachers, etc. The presenters were fantastic and kept our attention throughout the presentations. The biggest highlight for me was that on the day that I got to attend a course, I found out that there was a special lunch and learn for fathers. I immediately asked where it was being held and if I could still to attend. As it turns out, I was lucky and there was still a spot open. So, I grabbed my lunch and headed to the meeting and who do I see when I enter the room? David Hammer – Apraxia Kids VP of Programs and CCC-SLP! I knew who David Hammer was from our research on childhood apraxia of speech and discovering Apraxia Kids online. It was such a meaningful open floor conversation where all of us Dads got to speak and share our stories and concerns and successes. There were two other volunteer fathers that were running the session, but having David there was truly amazing! In fact, having ALL the Fathers there was amazing! This session truly made my experience at the conference an amazing one! This is something that I feel should be a staple at the National Conference each year. It would be so great to include a similar session just for moms as well. Brittany’s most memorable session was with Aron and her mother. Aron is a young adult who was diagnosed with apraxia of speech. It was so nice to hear to a story that we can relate to, to see how similar our situations are, and to witness how far Aron has come. Listening to them speak also provided a lot of hope for us. To learn of all of Aron’s accomplishments and to truly understand that with a lot of hard work, Brooklyn too, can have a voice of her own. We plan to attend next year’s National Conference, which is being held in Pittsburgh. This is particularly exciting for us as we are only a 3 ½ hour drive from Pittsburgh and we have been there before and loved it. We can’t wait to sign up! We hope to see and meet as many parents and family members as possible. The biggest things we learned from the conference was that we are not alone on this journey with our little star and that there is a wealth of knowledge that can be utilized should we ever need assistance. The number of experts that were at the conference was amazing and the ability to meet fellow family members who are sharing our journey truly was heart settling. What I mean is that it made both of us feel more at ease or stress free about our situation and the work that Brooklyn is going to have to go through. We learned just how many people/experts there are involved with Apraxia Kids and we learned that there is a wealth of knowledge to be shared. We learned that if you want to feel less stressed and you want an opportunity to listen to the experts and their experiences, that the National Conference is the place to be! If you’d like to join us at this year’s National Conference, you can now apply for a scholarship! The deadline for submitting an application for a scholarship is March 15, 2019! 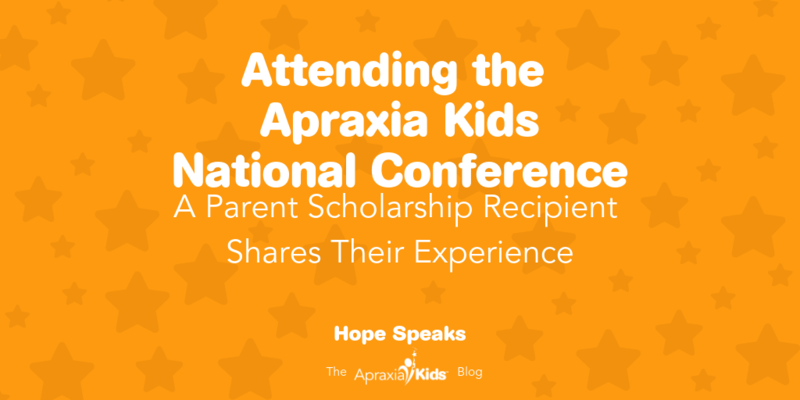 Apraxia Kids has awarded over 300 scholarships to attend the National Conference since we started hosting this event. We would not be able to make this event accessible to those who otherwise could not attend without the dedication of our donors, the passion of our volunteers, and the funds raised through the Walk for Apraxia.